Canada was five provinces strong and less than four years old when, in 1871, Prime Minister John A. Macdonald floated his promise. If the colony of British Columbia (BC) would enter Confederation, the federal government would link it to the east by a railway to be completed within ten years. Railway (CPR) would need to make roller-coaster traverses of three mountain ranges, squeeze through the canyons of the Thompson and Fraser rivers, and, finally, make an end-run around a fourth mountain. It is probably just as well that Macdonald had never seen those mountains. For if he had known about the perils posed by the western slope of Kicking Horse Pass – a place that would become known as the Big Hill – he may well have reconsidered and his dream of uniting Canada may never have become a reality. The many critics of the project were proved right. The fledgling country was incapable of financing a transcontinental railway. The surveys of the 1870s cost $3.5 million alone and would, by 1884, top $37 million. When construction finally got underway in 1880 it would devour $1.5 million per month. To orchestrate the construction chaos the CPR hired William Cornelius Van Horne, a railway titan from the Midwestern US touted as “the ablest railway general in the world.” Van Horne was more than equal to the task. In fact, he had energy and ideas to spare. To the chagrin of Canadian newspapers, Van Horne hired Major A.B. 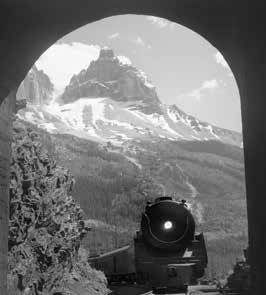 Rogers, another American, to plot the route for the railway through the Rockies and Selkirks. Lake, the waters of the Kicking Horse River tumbled westward, dropping 1140 feet in 7.55 railway miles. For fully 3.25 miles of that distance, the grade was 4.5 percent. would have required an extra year and the railway would likely have gone bankrupt with the resulting delay. After reassessing Rogers’ survey work, Van Horne put forward a “temporary solution.” He proposed to run the rails straight down the west slope of Kicking Horse Pass on the 4.5 percent grade. endure for 25 years until construction of the Spiral Tunnels. of including a heavy dining car, as this would have required a third locomotive. So Van Horne set the dining car on a siding and timed the arrival of trains to (hopefully) match meal times. the end of the first season of passenger train operation in 1886. The original building underwent annual expansions during its first two decades with a major addition in 1901 designed by F.M. Rattenbury. At its peak in 1908, Mt. Stephen House welcomed 8443 guests, boasted 60 rooms, a 200-seat dining room, a billiards room, and a library. Mt. Stephen House and Mountain, Field, B.C. visitors arrived that first summer. Many had to be turned away to sleep in boxcars at the railway station, for which privilege Van Horne charged a mere $1.50 per day. The CPR built its first log chalet on the shore of Lake Louise in 1890. 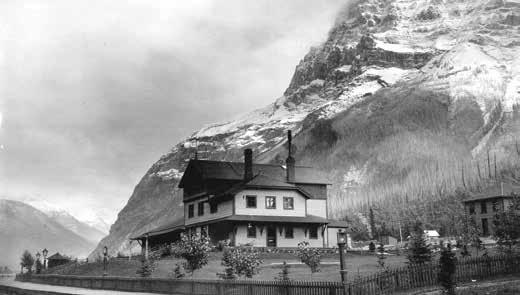 As with the hotels at Banff and Field, the facility went through many incarnations and by 1913 could house 400 guests. Whereas the CPR marketed the Banff Springs Hotel as a luxury resort, it pitched Lake Louise to those with a keen interest in the outdoors. As a result, Lake Louise became a beacon for artists and mountaineers whose published accounts helped to put the Canadian Rockies on the global map of places to visit. Click here to listen to a radio interview with Graeme about the Spiral Tunnels.